December 11, 2017 | -by: Kevin George. Q. Why should you never marry an email marketer? Q. Why did the marketer fail at honey harvesting? We’re sure you had a good laugh. That’s ‘coz we all love HUMOR. 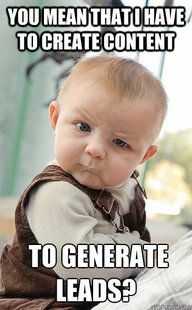 Yes, even the most serious looking email marketers among us. Humor has been a vital part of marketing since ages. And when it comes to email marketing, out of the dozens of emails that dive into our inbox every day, it’s that one humorous copy that puts a smile on our face. 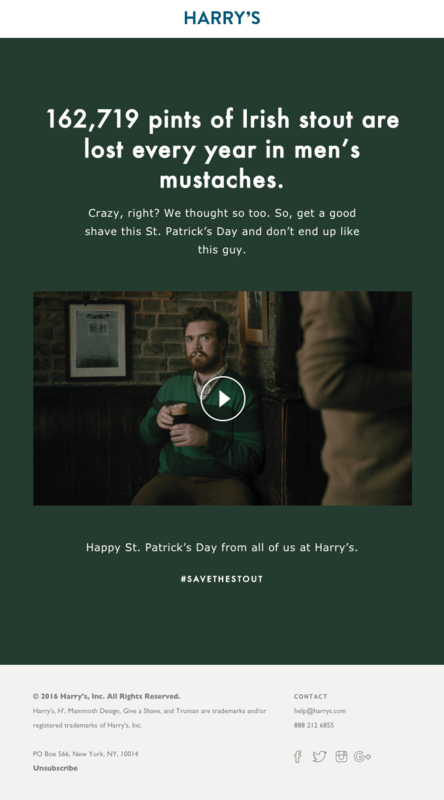 The email from Harry’s sent before Saint Patrick’s Day is just wow. While they wish their subscribers on the special day, their hilarious take on why men should shave at Harry’s on the occasion takes away the cake and stout. A copy that’s fun, a video that will make you laugh, and great use of the hashtag #savethestout- everything about this email is awesome. However, there’s one really important thing missing in the email- THE CTA. Poncho sends personalized weather alerts to its subscribers. What sets their email apart from the crowd is their whimsical way of saying what others say in a rather bland, to-the-point way. The copy is an amalgamation of facts and suggestions, again with a comical touch to them. And it’s not just the copy that will make you laugh but the bizarre hero images as well. There’s also space for enlisting other ways to connect with the brand, a way that ensures better engagement with the brand. Great work! MailChimp certainly knows how far you should take humor in emails. They are conducting a survey through this email which will help them improve their newsletter. While the humorous opening line tends to grab attention, they make sure they come to the point soon, slowly turning the humorous copy into something more serious. We loved Whisky Loot’s cart abandonment email. While we all know that a cart-abandonment email must be about convincing the prospect to buy what they left in the cart, the way you do it matters. Whisky Loot’s funny take on why the would-be-customer should be buying from Whisky Loot is so engaging and entertaining. The witty email copy ends in answering questions some frequently asked questions using a serious tone. Another brand that uses humor so amazingly. Kudos to the team! We’re adding another cart-abandonment email to this list, but we just couldn’t resist. Ray-Ban’s way of nudging the abandoner to complete the purchase is freakish yet engaging. Haven’t they succeeded in tickling the subscriber’s funny bone? Well, in our opinion, they certainly have. Once again, not totally diverting from the primary focus, the brand shows an image and essential details of the abandoned product with a CTA to help them make the purchase without any hassles. The most important question you need to ask yourself before using humor in your campaigns is – Is it relevant to your subscriber list, campaign idea, and your brand image? Go ahead only if the answer is YES. Remember that all of your campaigns can not have a humorous tone. Also, since your primary goal behind an email is marketing, a joke without a marketing message is basically just a joke. 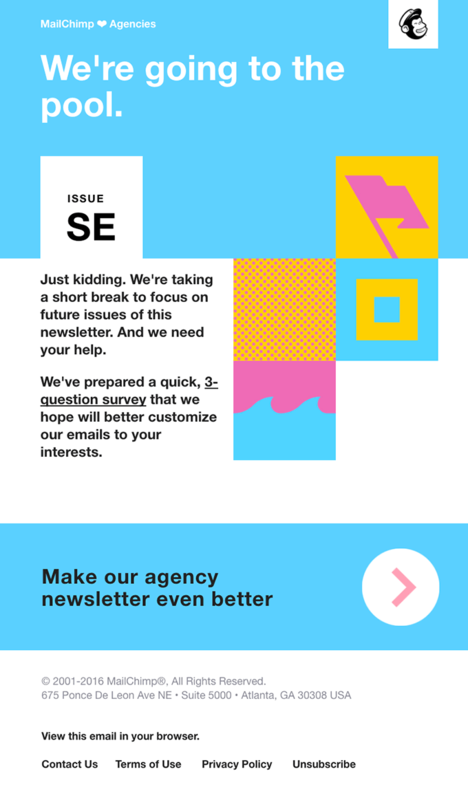 So, you need to smartly amalgamate humor in email copy, using it as a catalyst that encourages subscribers to click on your CTA and convert. Ideally you should start small. Try using a conversation tone in your email copy and add subtle humor to begin with. Check the email performance to see if you’ve found your subscribers’ funny bone. Another good practice is to A/B Test. You can probably pitch a serious tone against a humorous tone or try two different attempts at using humor in email. Humor helps to effectively cultivate a connection with your subscribers… but that’s when you use it in the right setting. Using humor in email is not as facile as it seems. While humor can work wonders for your email it can also be the reason for an unsuccessful campaign. A good understanding of your audience is a must if you wish to include humor. Also, you need to remember not to go too far and sound interruptive or distracting. 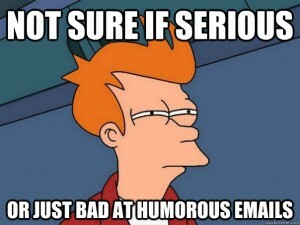 Have you used humor in your email? How did the emails perform? We’d love to know about it the comments below.